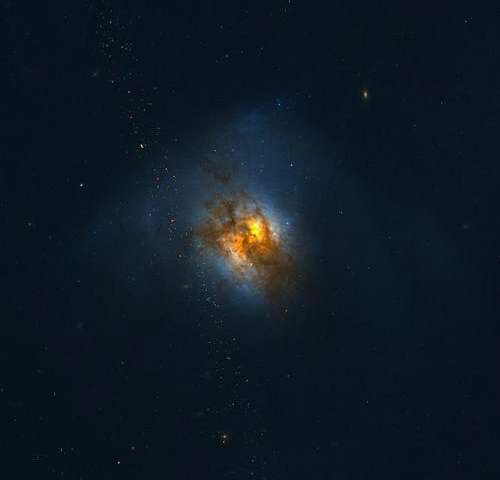 A new study from the Harvard-Smithsonian Center for Astrophysics finds that ultra-luminous galaxies can expel as much as a thousand solar-masses per year. Galaxies evolve over billions of years in part through the activity of star formation and their supermassive nuclear black holes, and also by mergers with other galaxies. Some features of galaxies, in particular the strong correlations found between the mass of the central black hole and properties like galaxy velocity structure or luminosity, imply a fundamental connection between the growth of the nuclear black hole and the assembly of stars on a global scale. Feedback of some kind is therefore expected to explain these tight correlations, and astronomers have been working to identify and study it. One prominent suggestion for feedback is the presence of warm outflowing gas, powered by new stars but which would deplete the galaxy of the raw material needed for making new stars, and/or for enhancing the black hole mass. In the 1990’s, the Infrared Space Observatory (ISO) detected evidence for warm gas in luminous galaxies, the molecule OH, and the recent Herschel Space Observatory followed up those detections with velocity-resolved observations of six of the prominent OH far infrared lines. CfA astronomers Eduardo Gonzalez-Alfonso, Matt Ashby, and Howard Smith led a team of scientists reducing and modeling the four strong lines in fourteen ultra-luminous infrared galaxies (ULIRGs). The set of OH lines from ULIRGs is remarkable in that they appear sometimes in absorption, sometimes in emission, and sometimes with a bit of both depending on the particular line and velocity component. Many of these spectral features are characteristic of gas moving in an outflow, and the team has developed a radiative transfer model to deduce the geometry and kinematics of the flowing gas from the complex line shapes. The scientists report that there are indeed powerful outflows in these ULIRGs, some with more than a thousand solar-masses per year and the power of a hundred billion Suns (a few percent of the total luminous energy of the galaxy). The typical time it would take for this gas to be blown out of the galaxy is only a few hundred million years, and the astronomers conclude that the outflows must occur erratically (not continuously), and are probably tied to the equally random flaring activity of the central black hole, which in turn can be linked to the gas motions induced by galaxy mergers. Be the first to comment on "Astronomers Reveal Powerful Outflows in Ultraluminous Galaxies"